For a few years after college, my brother and I both happened to live in Atlanta, Ga., a city where every street is named Peachtree. While there I discovered fried okra, fried green tomatoes, grits, black-eyed peas (which are white beans), sweet tea, and hot donuts from Krispy Kreme. It’s not exactly light eating down South. Comfort food has staked its claim and stubbornly resisted any marauding fad diets. One year for Christmas my brother gave me a Southern Living cookbook, straight off the bookstore sale rack. I think he might have paid $6 for it, tops. I knew this because the title was “Southern Living Cookbook 1994,” and this was late 1995. Anyway, the cookbook was a bit of a revelation for me as a someone learning how to cook for herself. The recipes were arranged by months of the year instead of by “meats,” “vegetables,” “quick breads,” and so on. What to make in October? Why here is a recipe for pumpkin curry soup, which has long since become a favorite. The recipes are relatively simple, too. “Summer’s Bounty” is naturally the longest chapter with such recipes as Cajun Green Bean Stir-Fry, Summer Squash Casserole, and Peach-Pecan Ice Cream. And there are a few more elegant sounding dishes such as Bacon-Blue Cheese Salad With White Wine Vinaigrette, which wraps long slices of cucumber around mini bouquets of greens, pecans, shredded carrots, bacon, and crumbled blue cheese. Fan-cee, y’all! “Autumn Harvest” has those warm dishes of fall illustrated with photos bathed in golden light and falling leaves. But I find myself resisting looking too closely at that chapter and the one that follows, “Winter Storehouse.” I’m not quite ready to let go of summer just yet. Besides, I’ll need something to look forward to as the days change. I may just have to give this cookbook as a gift to my brother as a way to remember our Southern by-gone days. But I think I’ll wait a year. At least. 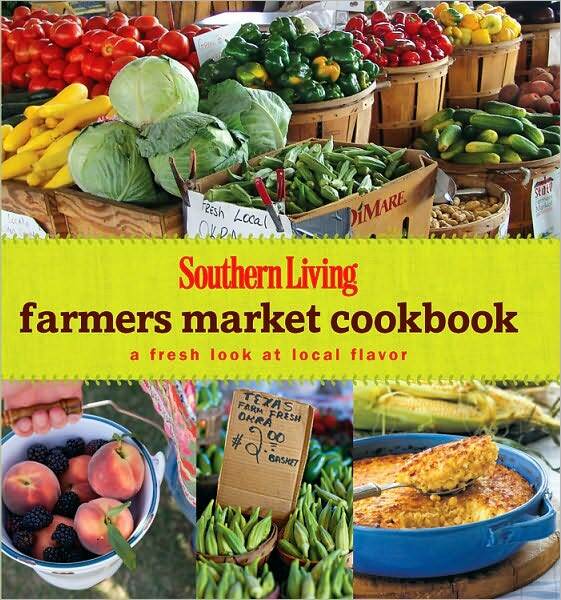 Yuuuuummmm…I love Southern Living recipes; I have a 30 minute meals SL recipe book, and as far as I can tell, all the recipes featured in the now defunct, I believe? magazine were all pretty fab. I think my sisters-in-law would have made great Southern belles (they’re feisty, pretty, fantastic hostesses, and one already says “y’all”) and they often cook SL recipes. This cookbook does sound like a good gift…but you’re right, I might wanna hold on to it before I give it away, y’all.